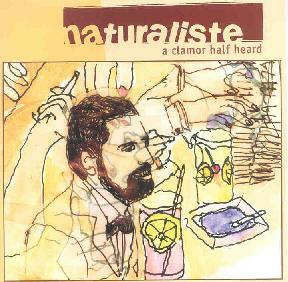 Naturaliste - "A Clamor Half Heard"
Naturaliste are a noise-art ensemble from Omaha, Nebraska and the tracks on A Clamor Half Heard were recorded live in 2001. Wailing, noodling saxophone, electronics, guitar, percussion, and undetermined other instrumentation (I heard a violin at one point) make for a huge glom of experimental noise and bits of free-jazz. Feedback and floating minimal patterns are key elements as are devastating noise assaults. There are lots of interesting ideas here though it didn't consistently hold my attention throughout. Noise-art of this type is usually difficult anyway and it's hard to articulate what works, though I can say that the most interesting parts were when evolving noise patterns were combined with multiple other sounds, giving me more to focus my attention on than just a huge wall of white noise. The inclusion of percussive clatter at any point proved to be a bonus and the saxophone usually helped make things more interesting. But my hands down favorite track was "Static Beauty". It sounds like a shortwave radio dial being blasted up and down the band, but done so in a rhythmic way that produces interesting results. Kind of like turntable scratching with a shortwave. And "jamming" with the saxophone makes for a surprisingly smooth blend.